I wanted to use this article as an introduction to 'The Optical Universe'. A Nature based Science and Philosophy to help explain the Universe and everything in it. This work is inspired by the likes of Nikola Tesla, Viktor Schauberger, and especially Walter and Lao Russell. So I will begin by sharing a description of how I feel this all works and how this can help mold the world into a better place. There is really one law in the Universe and that is balance. All other things come from balance. The Universe doesn't allow anything other than balance to be replicated. Balance is based on the Love principle of giving and re-giving. The principles of rhythm, vibration, time, motion, color, sound, etc… are all based on balance. We live our everyday reality in a motion based Universe but truly reside in the stillness of Mind. Mind is what I would call our true selves, higher self, and ultimately 'God' or 'Source'. Even though there is a piece that we experience and call 'I' seemingly separate from the whole, in the true reality of it all, we are part of the whole. We are the whole. We are connected to everything and everyone. This sensed based reality is a thinking, moving one. Only in the stillness of non-motion can we be connected to our source and our true being. This is when we are truly the person we are supposed to be. We cannot live a life of harmony using our senses because they are just the receivers and interpreters of the moving vibrations. Nor can we just live from the brain. The brain can be likened to a computer hard drive that is storing the past memories and then pulling them up as needed to be used. This can be a problem as these memories and logic can be swayed by the filters of our upbringing or surroundings and not from our true self. The senses pick up vibrating waves of color, sound, smell, touch and then interpret them through the brain. Many will disagree with the concept of the brain and Mind being different things. But the Mind works with knowing, and knowing can only be accessed in the stillness. Part of the problem with the world today is that we push regurgitation of data to our children and praise the ones with the best memories. We applaud the best storage capacity rather than listening to our intuition and heart. In this Universe of motion, everything is moving, oscillating, and pulsing, all at different cycles and all around us. From galactic bodies, to atomic systems, to even our own breath. In breathing and out breathing… life and death. But this death is only a seeming one, as nothing dies, only the start of the other part of the cycle to then be repeated infinitely. Giving and re-giving forever. A balanced interchange of the seemingly divided and polarized equilibrium. I say seeming because this reality is still all an illusion of motion. The equilibrium is the stillness of Mind. Mind is God. God is source. Thinking is the worker that stimulates or pushes into action the motion of this physical reality. The stillness is divided or polarized in two halves and in two directions away from each other. These polarized halves seek the stillness of their opposite and perfect mate. Thinking is electric. Electricity is the only worker in the Universe of motion. 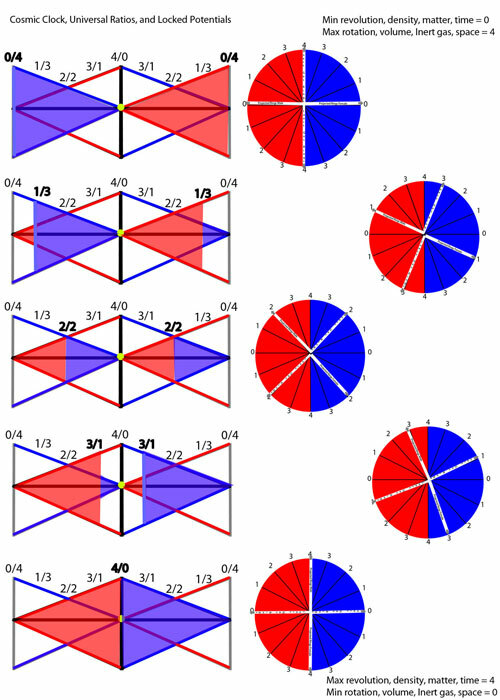 The two polarized halves are male and female. They are the divided light, red and blue. They intertwine and interpenetrate to create what we call the chemical elements and the basis of all creation in this reality. The stillness or equilibrium is the undivided Light. Everything in this Universe is made of Light and by dividing the Light this motion based reality is formed. God is Light. We are Light. Light is manipulated by motion in curves and spirals. It is compressed and expanded during its cycle from birth to death and back again. All motion is spiral and all direction is curved. 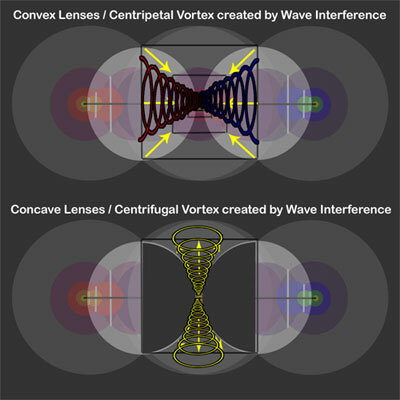 Curved and spiral motions describe the vortex motion. There are no straight lines in this motion based Universe. The structure of this Universe is based on the shapes of the cube and the sphere. All other shapes including the platonic solids are in different phases of the process of becoming a cube or sphere. The different stages of the sphere and cube interaction are shown all throughout nature. 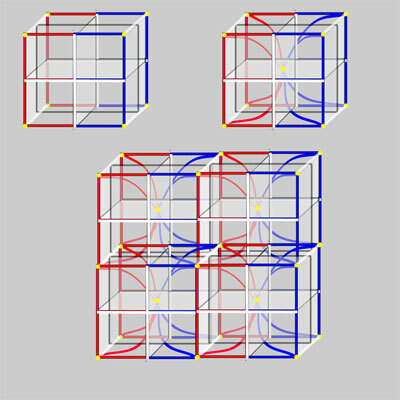 Cubes are made up of planes and points of stillness (equilibrium / undivided white Light). Cubes bind matter (wound up light), with the sphere being the matter itself. The interactions of all things in motion are recorded in what some call the Akashic records, or the inert/noble gases. These are the chemical elements that link God's still Universe to our motion and sensed based reality. They are the seed record of all that has happened and will record all that comes. This can be likened to a microfilm or film strip. From this seed springs the image of what has been recorded to be projected onto God's movie screens of space. Thought rings or wound up light are compressed and expanded at differing speeds and cycles to create this illusion we call reality. The cycle of these interactions are called waves. Waves are all around us interacting and interfering with each other all working together to create this eternal movie. What we see and measure such as magnetism, gravity, our senses, etc… can be explained by the vortex motions, wave interferences and cube sphere cycles. All of them happening within each other, around each other, and from each other. Everything is intertwined and connected. What you do to yourself, you do to others and vice versa. This is a magical dance of light movements and pulsations creating this cosmic kaleidoscope of motion we call life, but our true selves reside in the knowing stillness of the Light we call God / Source / Creator. WARNING: If you are prone to nodding off, day dreams, or thinking about what to make for dinner, the next section may be a little bit boring or heady. I will go into some the science but a full explanation would require way more space and many more articles. So… this nature based science explains the cycles from stillness to maximum motion at wave amplitude, and the return journey back home from which it came. This science includes the concept of the Cosmic Clock and Universal Ratios. They are important because they show the interactions and change regarding ratios of rotation, revolution, time, space, matter, density, volume and more. During these cycles from cathode beginning to wave amplitude or anode, there are steps or pressure walls that hold the wave in place, until there is enough 'energy' or desire to move closer to amplitude. Moving closer means to compress and to raise electrical potential. Amplitude means that 2 waves have come together in harmony. This is the balanced position that we see in our Sun or in the element Carbon. These are called the 'locked potentials'. Carbon is the balanced point in the cycle where the centripetal, compressing, living cycle is at its maximum and must now start the return journey home. Centrifugal, expanding, dying cycle must now increase from here. 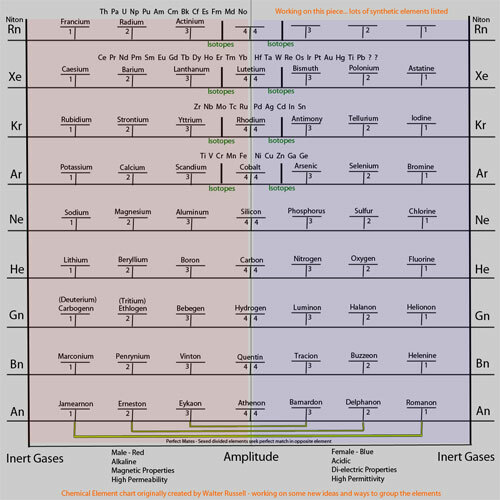 If we look at this balanced cycle of elements, it shows us that there are many elements below Hydrogen. There has to be balance and that means there has to be longer, slower, more nebulous waves below H. This shows us that we can move between elements at will by just changing the wave properties or pressure positions. This science explains the true nature of our Electric Universe and how magnetism fits in. It covers the importance of convex, concave, and meniscus lenses that guide light in different ways. With these concepts, does this not change everything? Does this not give us a reason to re-evaluate things like Quantum Physics, Black Holes, and the Big Bang? Does this not tell us that we should re-evaluate particle physics and the electron model? From here we begin our journey from our knowing Mind through our moving senses to learn the true nature of things. We can give ourselves permission to no longer fear, worry, hate, or feel these unnatural vibrations. For they do not exist in the equilibrium or stillness. Only Love… This Universe is built on Love and all other unbalanced 'things' are created by man or man's unbalance. We have the 'free will' to do as we please, but this is a giving re-giving Universe, so it is in our best interest to be aware of our thoughts and actions to aid us in manifesting the best possible experience. We should choose to follow Nature. Nature shows us how we should build, how energy should flow, and how to be efficient relating to just about anything. With this living philosophy and science, we can change the world in many ways. From transmuting the chemical elements to eliminating nuclear technology and waste. From removing the reliance on fossil fuels to taking care of the planet and all that live here. I find that this Optical Universe of moving lights and the Stillness from which it springs, can help correct the faulty foundation and errors in today's scientific thinking. We need to just study the importance of waves, wave interference, and lenses to help understand the cycles and vortices that shape all that we see and measure. I am just a layman using this understanding to help explain things like cosmic background radiation, LENR technology, fusion/fission, radioactivity, electricity/magnetism, and more. Each time I find the answers are there we just need to look at it from Nature's point of view. Thank you for reading and joining me on this journey of new understanding. Together we can change the world.